These trails encompass a remarkably wild area in the midst of one of the most developed parts of Westford. The industry along Lyberty Way was built in 1982, and much of the commercial development along Route 110 was from that time period. The views vary from just woods, to wide floodplains, to narrow brook channels. 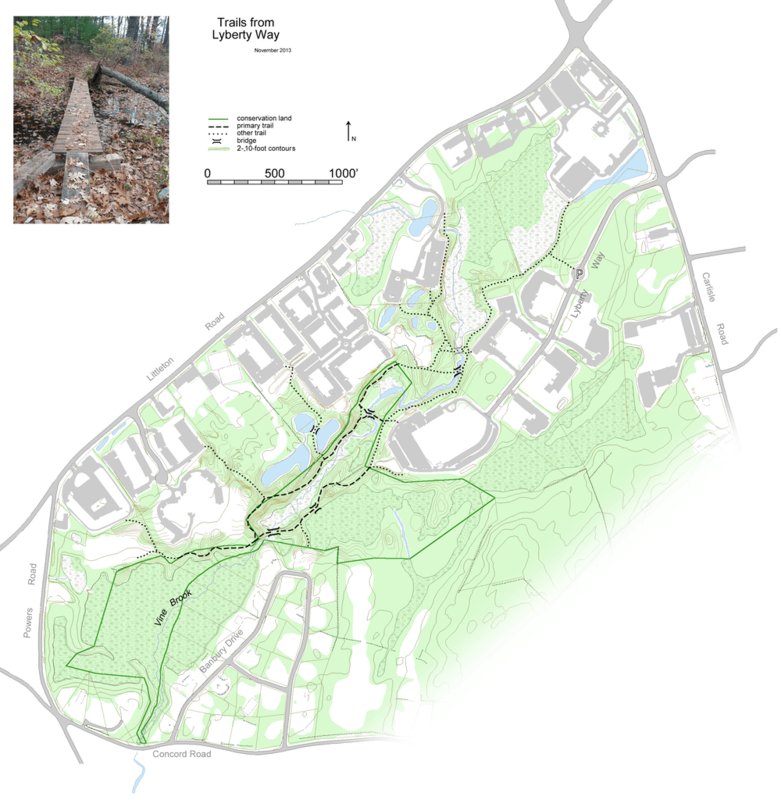 Loop hikes are possible, as there are four bridges across Vine Brook. In 2013, one bridge was washed away and is indicated by a ghost bridge. Nearby is a newer, sturdier bridge, so the old bridge is obsolete and unlikely to be replaced. Also, the westernmost bridge, which is set low over the brook, has been seen submerged. So during periods of high water or beaver activity, it may not be a viable means of staying dry. There are many side trails to local businesses, indicating frequent use of the main trails on both sides of Vine Brook. Please be respectful of these neighbors so the entire trail system may continue to be used by employees and visitors. From Lyberty Way, head away from the road until the trail ends at a T junction. Remember some landmarks here, as it i­s very easy to miss the junction on your return. Turn left to access the bulk of the trails. When you come to a small lawn where the trail seems to disappear, continue as straight as possible to pick up the trail again in the woods. The first right turn leads to the site of the washed away bridge. The next bridge is a much easier crossing. Make your way downstream on either side of the brook. The third bridge is somewhat flexible but quite safe; it is pictured on the map. The fourth bridge is a pair of planks across the drainage from the wetlands south of Lyberty Way to Vine Brook. The last bridge is the one that may be submerged. The most park-like section of trail is on the western side of the brook, upstream across from the trailhead. It i­s a boulevard with stone edging, rhododendron landscaping, and fine views of the brook. The central section, on the western side of the brook, travels at the base and along the ridge of an esker, one of many in Westford. Eskers are the remains of streams that ran beneath glaciers. When the ice finally retreats, sand and gravel is left as winding ridges, usually 10-30 feet tall. The high point of this esker is indeed 30 feet above Vine Brook. Due to their nature, any rocks you find are likely to be rounded, even on the ridge. The woods may also be followed from Concord Road where there is a sign for The Heald Land. But there is no developed trail there, mainly because it would quickly run into marsh. Parking is best at the bulge in Lyberty Way. From there, find the faint trailhead in the middle of the north (right) bulge.